Click Here to View and Participate in the New Survey! Your Thoughts and Comments will Guide us as we set the Seminars and Clinics for the balance of this year. Thank You for participating in the last survey … and Thank You in advance for Commenting on our Next Survey!! The word change always scares us. We resist it because change requires great effort and adaptation. Within The Foundation we are making major changes to match the fundamental needs of the market. In addition to the implementation of a new internal software system and other items related to social media, we have decided to move our offices to Southern California from Albuquerque, New Mexico. We chose our new headquarters to better meet your needs. A large majority of Spanish Horse lovers have their homes in California, many cutting-edge technologies and marketing tools will be right at our hands, and a number of our sponsors are based there. All of these factors together will make us a better organization. This move will take place in March. Our phone numbers and email addresses will continue to function normally and there will be no interruption in the communication services. To our Supporters, Friends, and P.R.E. Horse lovers we want you to know that we are making great changes to benefit our organization and adapt it to a better future. Ride with The Foundation on a Pilgrimage to Santiago de Compostela in Spain. Tour Costa Rica Horse Farms and Natural Beauty. The People at the Foundation are totally dedicated to the Pure Spanish Horse. Please review our site and contact us with any questions or for further information. Note: The P.R.E. Horse is also known as the P.R.E. Andalusian Horse. However, because it is bred all over the Americas and Australia it is officially known as a P.R.E. Horse - Pura Raza Española - or in English the Pure Blood Spanish Horse or Pure Spanish Horse. 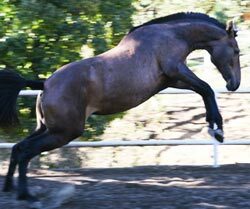 The Foundation for the Pure Spanish Horse maintains the P.R.E. Mundial Registry. Registered Horses trace back to the Original Stud Book maintained by the Cria Caballar (a branch of the Spanish Ministry of Defense for 100 years). We consider the P.R.E. Mundial Registry to be the most authentic P.R.E. Registry functioning today. OUR MISSION: To Protect and Preserve the Pure Spanish Horse, fostering an appreciation and understanding of the Breed through education of the public about the Pure Spanish Horse's history, traits, and relationship to humans, as well as sponsorship of Programs introducing the Pure Spanish Horse to the public. ​We are especially dedicated to the success of the American P.R.E. Breeders and Horses.